Having an order cool mist humidifier is the perfect appliance during the warm summer months. Cooling the air around your home down, it is a definite must-have in your home. It is also perfect for families with young kids or pet as it has no heating element. But for the cold winter months, when the air is truly dry, there is nothing like a warm mist humidifier. Warming the air around you, this appliance is essential to winter living. Preventing illness, keeping your skin moisturised and soothing congestion, a warm mist humidifier is a fantastic alternative to keeping you and your family happy and healthy. By heating the water inside the humidifier to almost boiling point, the appliance kills almost all of the bacteria and mold living in the water tank that can cause illness. Once the water is warm, the humidifier releases a pure, clean and healthy mist into the air of your home for you to breathe in. Unlike cool mist humidifiers, the warm mist does not require a fan so it is extremely quiet. This type of humidifier also does not use a filter or wick making it extremely easy to maintain and has no additional costs. With a marketplace filled with various brands and products type, picking the perfect warm mist humidifier can be tough. 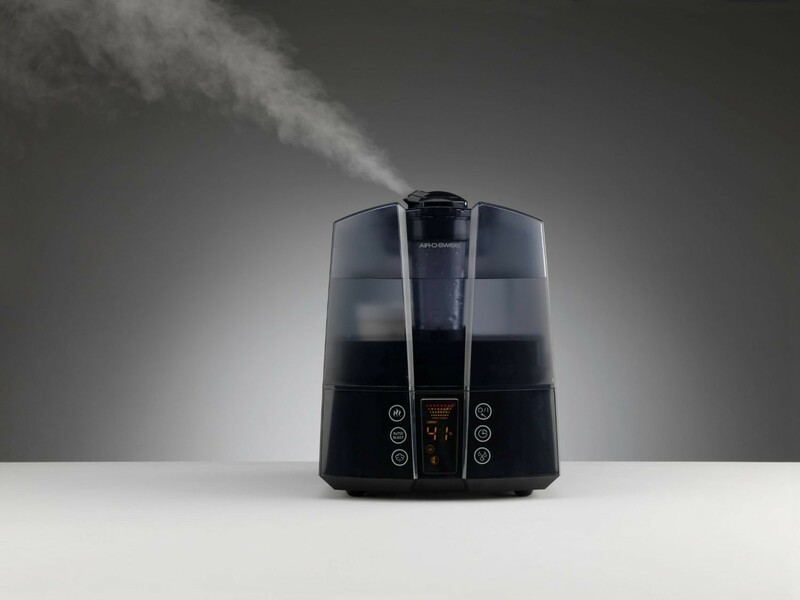 But with this list of the best warm mist humidifiers you can be sure to find the perfect match for your home or office. With an artistical appearance, AOS 7147 Ultrasonic Humidifier could be a beautiful addition to any office or home. Producing fine mists through high-frequency vibrations, the Air-O-Swiss AOS 7147 Ultrasonic Warm and Cool Mist Humidifier give the best of both worlds as it is both a cool and warm mist humidifier. 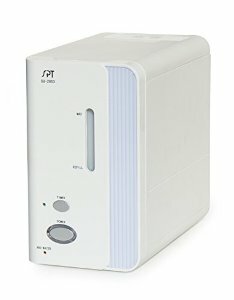 The ITC technology enables this humidifier to control the room temperature automatically by adjusting the output if there are any changes of the interior temperature. The touchable controls displays the current humidity level,the set desired target humidity level and can pre-heat the water to improve efficiency. Cleaning this humidifier is easy as the removable demineralization chamber helps remove impurities out of the water and ensures that there is less mineral build-up. Plus the built in Hydro Cell keeps the humidifier clean for a long period of time making it extremely low maintenance. 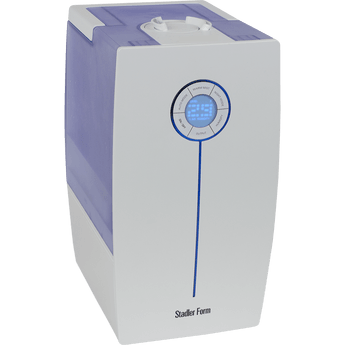 Operating almost silently and covering a space of up to 600 square feet, the humidifier is perfect for a bedroom or living area. It also runs for up to eight hours before needing to be refilled hours per filling, but this is based on the setting. If having a home that feels warm and smell great is a priority to you, then the SPT humidifier is the perfect appliance for your home. Dispersing a comfortable amount of warm mist into the air, this humidifier helps relieve the symptoms of colds, flus, irritations and dry skin. This humidifier also perfumes the air with the essential oil of your choice. By dropping essential oils into the diffuser, your home turns into a fragrant haven. This is perfect for smoker and pet owners as the essential oils help get rid of bad odurs. With a 2.5-liter reservoir, this unit can generate mist for up to eight hours without being refilled. And when you do need to refill it, you can easily remove the water tank to do so. You can also let this humidifier run throughout the night as it has an automatic shut off that turn the humidifier off once it runs out of water. Running your humidifier throughout the night in your bedroom allows your skin to absorb the moisture leaving you with soft, supple skin – something that cold winter air does not promote. Having a humidifier run your bedroom also makes your room warmer which promotes better sleep. The moisture in the air also stops snoring which is a huge benefit for any partner of a snorer. 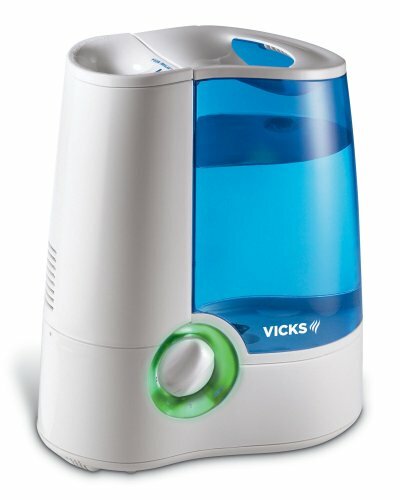 The Vicks Warm Mist Humidifier with Auto Shut–Off comes with two comfort settings which can be changed according to the level of moisture you need in the room, or the strength at which the Vicks VapoRub needs to be released. With a mist that is 95% bacteria free, it is the perfect humidifier for those who are recovering from a cold, and hoping to keep all harmful bacteria at bay. You can keep this humidifier running throughout the night as it has an automatic shuts-off that occurs when the runs out of water. With a large one gallon tank, the humidifier runs up to 24 hours on the lowest setting before needing to be refilled. 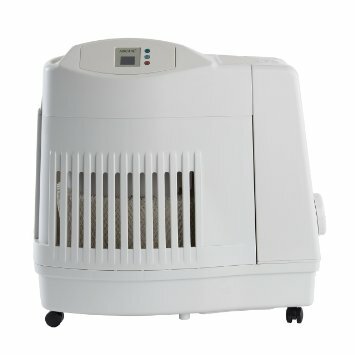 The humidifier is also filter-free which means that it is easy to clean. It is important to note that you will still need to take this humidifier apart to clean like all other humidifiers to clean. Pay special attention to the mineral buildup around the heater which can cause blockages and other health issues. The easiest way to clean this humidifier is put all the removable parts into the dishwasher. Coming in both blue and white, the humidifier can easily fit to any home decor. The tank is also easy to handle when detached for refilling, and can just as easily be replaced without spilling the water. Leakage has been an issue for some users of this appliance and is something to be aware of. Whether you’re purchasing a warm mist humidifier for health issues or to keep your home snug and warm, buying this appliance has numerous benefits. Keeping in mind that this humidifier has a heating element and the mist that is released is warm, it is important to remember to keep an eye on small children and pet around the appliance.